If you’re interested in learning more about the history of riding in America, I suggest that you get a copy of James A. Ottevaere’s “American Military Horsemanship“, as it is one of the most informative books on the subject. The topic of the book is the military seat of the U.S. Cavalry. 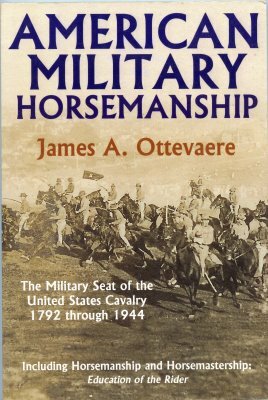 James Ottevaere covers 150 years of military horsemanship in America from right after the Revolutionary War until the dismounting of the Cavalry in the ’40s. He compares the manuals and training guides that were used and the changes that were made in both the size and existence of the cavalry. J. Ottevaere also goes into no small detail about the equipment that was in use. James Ottevaere supports his text with many helpful period photographs from his own collection. American Military Horsemanship is turned into a solid teaching tool with the addition of “Horsemanship and Horsemastership: Education of the Rider”. This book is a must read for any serious student of horsemanship. 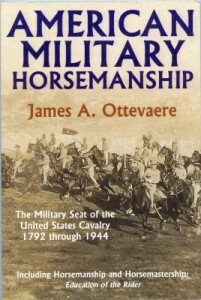 “American Military Horsemanship” by James Ottevaere is published by Author house, Bloomington, Indiana, 2005. It can be purchased through Amazon or you can purchase a signed copy through the Cavalry Club by right mouse clicking the title of this blog. Enter the Cavalry Club at your own risk! This book is good reading, good education and good history.